The Planning Department has a lot of information about what’s happening around Baltimore. This page directs you to resources to help you find out what’s happening in your area. You can find information about demographic data, neighborhood plans, development projects, etc. CityView is an interactive map that provides a lot of information about what’s happening around the City. You can use this tool to look up property lines and ownership, zoning, historic districts, plan boundaries and much, much more. 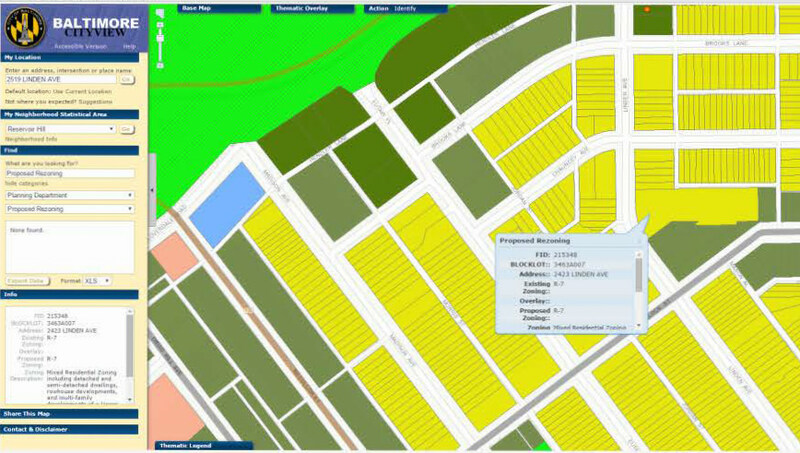 The Neighborhood Profile Map allows you to click on neighborhoods on the map and view neighborhood demographic profiles. You are also able to explore various layers in the table of contents from demographic to housing data. Map - If you are particularly interested in development, EconView is an interactive map that can provide a lot of information about projects that are approved and under construction. Permits - To look up permits for a specific address, go to Baltimore Housing’s permit search tool. Use 311 to report work without a permit. Development Regulations- To understand the regulations that guide the type of development that is permitted, check out the City’s zoning code. To find out the zoning for a particular site, go to CityView. Many areas of the City have additional land use and design regulations through Urban Renewal Plans. For additional regulations, check out the City’s Charter and Codes. Development Review - Many developments are reviewed by one or more development review body. Click here to view the Development Guidebook. Planning Commission reviews subdivisions, Planned Unit Developments, certain conditional uses, rezoning requests, street closings, other legislation and more. The Board of Municipal Zoning Appeals (BMZA) reviews variances, certain conditional uses, and other zoning appeals. City Council reviews Planned Unit Developments, certain conditional uses, rezoning requests, and more. You can track land use actions through the City Council process by using their legislative calendar. The Commission for Historic and Architectural Preservation (CHAP) reviews development in local historic districts. The Planning Department hosts two advisory review bodies: the Urban Design and Architectural Review Panel (UDARP), which provides advice about urban design for major development projects, and Site Plan Review Committee (SPRC), which provides technical review of site plans. Planning Department staff review development projects for compliance with Forest Conservation, Critical Area, Floodplain, Urban Renewal Plans, etc. Development Opportunities - Baltimore Housing lists many development opportunities on their website, including individual City owned properties available for purchase and large scale redevelopment opportunities. You can also check out Baltimore Development Corporation’s Requests for Proposals. 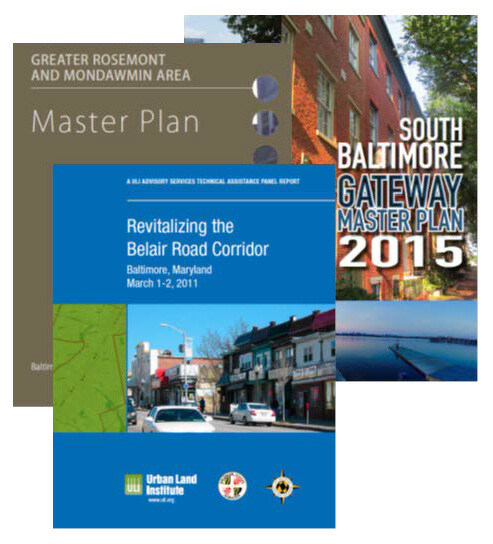 Comprehensive Plan - Baltimore City’s comprehensive master plan is called LIVE, EARN, PLAY, LEARN. It is a business plan for a World-Class City. Neighborhood Plans - Baltimore is a city of neighborhoods, and therefore we have many neighborhood plans. In addition, we are working on INSPIRE plans for the neighborhoods around the schools in the 21st Century Schools Initiative and Leveraging Investment in Neighborhood Corridors Strategy (LINCS) plans for commercial corridors. Topic Plans – In addition to neighborhood plans, we have many other types of plans, including park master plans, sustainability plans, transportation plans, and other policy documents. Urban Renewal Plans - The Planning Department administers Urban Renewal Plans that contain land use, zoning, acquisition, disposition, and design regulations. Capital Improvement Plan - The Planning Department prepares the City’s capital budget and six year Capital Improvement Program (CIP). Demographic data can help people understand what’s going on in a particular area and help people make better decisions. The latest data can also be found by accessing the Department’s new City of Baltimore Profile and Neighborhood Profiles for select neighborhoods. These resources draw from the latest American Community Survey data from the U.S. Census Bureau and are updated annually. The American Community Survey (ACS) is an ongoing survey conducted each year to provide the latest information on the social and economic characteristics of communities across the United States. It includes questions about age, race, family characteristics, income, housing costs and transportation mode, among other household and population characteristics. The Planning Department also prepared Neighborhood Statistical Profiles, which draw from 2010 Decennial Census data. The Decennial Census, last conducted in 2010, is mandated by the Constitution and takes places every ten years. The data collected determines the distribution of federal funding to local communities. It provides an official count of the entire U.S. population to Congress. Another rich data resource is Vital Signs from the Baltimore Neighborhood Indicators Alliance (BNIA). This report compiles data on more than 150 indicators related to demographics, housing, crime, workforce, health, housing, education and sustainability across 55 Community Statistical Areas (CSAs). CSAs reflect United States Census Tract boundaries, allowing year-to-year comparisons to be made. Additional data layers are available through Open Baltimore. The Department of Planning’s comprehensive planners work with neighborhood stakeholders throughout the City on various planning initiatives. The Department of Planning also maintains a Community Association Directory if you’d like to directly contact community leaders.